Sound and Fury, Signifying Nothing | American University Washington D.C.
SPA professor James Thurber co-edited a new book called American Gridlock. You’ve seen partisanship and you’ve seen gridlock. You turn on C-SPAN, and you might watch two members of Congress lambasting each other. You can see vitriolic smackdowns from pundits on cable TV. And it’s omnipresent in everyday life, too. If your uncle was espousing irksome political opinions over Thanksgiving dinner, you might have been struck with the urge to fling mash potatoes at him. Academics have attempted to ascertain just how Americans became so divided. And this is where American University School of Public Affairs Distinguished Professor James Thurber made a noteworthy contribution, co-editing a newly-published book, American Gridlock: The Sources, Character, and Impact of Political Polarization. It’s immensely valuable because it pulls together many different facets of academic research on this subject into a single volume. It’s like a one-stop shop for how the U.S. became a polarized nation. And Thurber has gathered an all-star group of academics to contribute chapters for the book. This includes fellow AU SPA Professor Jennifer Lawless. With a deeply divided Congress, a lame duck president, and the 2016 presidential campaign already at a fever pitch, this issue couldn’t be more timely and pertinent. “The two parties are really in two different universes, totally talking about different things. No one is coming together in dialogue,” says Thurber. In a recent interview, Thurber talks about contemporary partisan rancor, and one way he measures that is through congressional voting. Members of opposing parties are voting together about as infrequently as they did just before the Civil War, he says. Below: Professor Thurber's less-than-one-minute explanation of how reforming redistricting could help address the problem of political polarization in the US. In the 1960s and early 1970s, there was plenty of cross-party cooperation. Roughly one-third of members in the House and Senate were moderates voting together, Thurber says. But the situation since that time has deteriorated. “From the early 1980s to present, every year we’ve lost more and more people voting together, and fewer and fewer competitive [congressional] races in the general election,” he says. A prime motivating factor for this transition was the dwindling number of conservative Southern Democrats, Thurber says. The entire South became reliably Republican, and the blueprint for the eventual “red” and blue” America was born. Though this process started in the 1960s with Democratic President Lyndon Johnson’s embrace of civil rights legislation, it hadn’t neared completion until much more recently. “Just to put it in perspective: In 2008, we had 58 [moderate-to-conservative Democrats], and now, if they’re willing to even say they are, it’s about six Democrats. And there are no moderate or liberal Republicans,” says Thurber. In the introductory chapter written by Thurber and co-editor Antoine Yoshinaka, they explain how partisanship in Congress has stifled the budgetary process. “Partisan battles over the federal budget over the last 20 years are a prime example of the fundamental policy differences between the parties. Bipartisanship is rare if not nonexistent in Washington when it comes to tax increases and cuts in popular domestic programs. Both are needed to reduce the deficit and the debt, but the parties have taken increasingly extreme positions on their willingness to compromise on taxes and means testing in social programs,” they write. When examining the nation’s gridlock, it’s a little like diagnosing a patient with numerous maladies. Where do you even begin? The book is broken into five parts: polarization among voters and activists; polarization in national institutions (Congress, the presidency, and the Supreme Court); polarization in the states; polarization in the media; and a final section with implications and conclusions. Alan Abramowitz writes a strong overview of the new American electorate. Straight-ticket voting has reached record levels, and the 2012 presidential campaign saw the highest level of party loyalty of any race since exit polls started in 1972. “According to the national exit poll, 93 percent of Republican identifiers voted for Mitt Romney and 92 percent of Democratic identifiers voted for Barack Obama,” Abramowitz notes. Later on, Samuel Abrams and Morris Fiorina argue that the number of nonpartisan voters in the middle has actually not shrunk. Instead, the electorate has “sorted,” meaning the two political parties are more ideologically homogeneous and distinct from each another. “Party sorting increases inter-party conflict and makes cross-party compromise more difficult,” they write. David Karol documents the prominence of issue-driven interest groups, from the NRA and the anti-tax Club for Growth on the right to the League of Conservation Voters and abortion-rights group EMILY’s List on the left. He notes that these activist groups are now quite integral to the party coalitions. And in looking at campaign donations, interest groups have become more inclined to give money to candidates from just one political party. There are a number of other solid contributions here. Brandon Bartels has a chapter on how the Supreme Court has generally become more polarized over time. Boris Shor looks at polarization in state legislatures, which can be more intense than it is at the national level. Three contributions look at the relationship between gridlock and the media. AU’s Jennifer Lawless and her co-author Danny Hayes determine how polarization affects local news coverage. Lopsided House races receive less substantive local news coverage than competitive races, Lawless and Hayes found. And since so many Americans live in safe, one-party dominated congressional districts, this dearth of local campaign stories could have broader consequences. Many political observers believe that partisan media outlets, like FOX on the right and MSNBC on the left, provide divisive content that radicalizes their viewers. 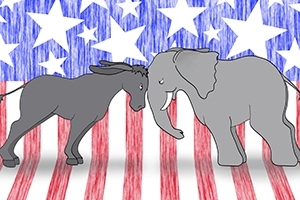 In this book, Gary Jacobson believes that partisan media likely contributed to the record levels of partisan polarization in the 2012 presidential election. He also looks at how certain issues are covered. Climate change, he points out, is treated quite differently by conservative commentators like Rush Limbaugh and Sean Hannity and left-leaning figures like Jon Stewart and Chris Matthews. Views on human-induced climate change did not differ by party in the 1990s, but by 2012 it was considered established fact by liberals and widely denied (or viewed skeptically) by conservatives. “Thus, it is not surprising to find large residual effects of partisan media attention on beliefs about climate change and that polarization on this issue was unusually high,” he writes. Kevin Arceneaux and Martin Johnson argue that partisan news media is probably more a symptom of polarization, and not its cause. Among several reasons, they note that a relatively small number of people consume partisan news shows. Thurber says there is no single formula that explains these divisions. You have cultural issues like guns and abortion that have created chasms in the American electorate. And the party coalitions are now fragmented by race, with white males increasingly aligned with the GOP and minority populations supporting Democrats. And gridlock is also reflective of lifestyle choices and environment. Thurber says people’s beliefs are often influenced by where they live, whether it’s an urban community or a rural town. Even if economic dislocation increases Americans’ mobility—with conservatives moving to liberal areas, or vice versa—it doesn’t necessarily diversify a region’s ideological composition. Many liberal commentators believe that tea party Republicans have no desire to govern, and thus, no impetus to work with Democrats. And some researchers also put much of the blame for the current stalemate on the Republican Party’s rightward drift. Yet Thurber disagrees, arguing that the left also bears some responsibility for national gridlock. And in the book, Thurber and Yoshinaka explain why Republicans have an incentive to compromise. “The fact remains that a vast number of policies (or repeal thereof) advocated by those who generally identify as conservatives still require government to act,” they write, mentioning GOP goals like tax cuts, pension reform, and curbing public unions. In the end, Thurber says, both political parties do the voters a disservice. Even with hardball, winner-take-all politics, everyone still finds a way to lose.